In October 1991, a couple camping on Bates Island in Algonquin Park, Ontario, were attacked and killed by a bear. Claire Cameron’s book is based on this attack, but she added the kids. 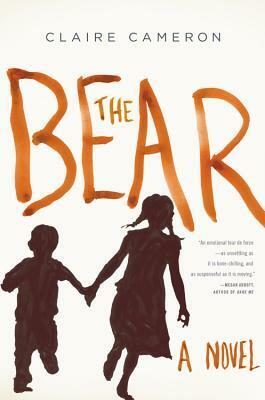 The Bear was recently long listed for the Baileys Women’s Prize for Fiction. My family went camping every summer when I was growing up, and we continue to do it with our own children. We have often joked about seeing bears. My Dad, at 6’4″, was always appointed as protector, but luckily we have never come across one in all these years. I know that this is partly because most of our camping takes place in Nova Scotia, where there are not as many bears as there would be in other places, like Northern Ontario. But I know they are still around, and last year we did see a bear cub on our way into the National Park in New Brunswick. I have always thought bears to be beautiful animals, but I think I’ll stick with the raccoons and porcupines. The Bear is told through the eyes of Anna, a five-year-old girl. She is left alone to fend for herself and her two-year-old brother, Stick, after their parents are killed by a bear on their camping trip. The kids don’t actually see the attack, which is a relief for us reading the book, but she knows enough to be scared and confused. Cameron does a remarkable job taking us into the mind of a young girl who is trying to figure out what to do in a terrifying situation. We get to hear Anna’s thoughts, and how she rationalizes everything to herself. At times, she tries to be grown-up, mimicking her mother when talking to Stick. Other times, she acts more her age; wondering why their parents don’t come and get them, feeling like she must have done something very bad to make them stay away, inventing fantastical stories and reasoning for the circumstances she finds herself in, trying to draw comfort from her teddy bear. She also spends just as much time being angry at her brother, and jealous of him, as she does loving him and taking care of him. I do a big roar and Stick turns around and his eyes are puffy but they still go big and he looks scared and all he does is cry. Stupid Stick. He will be no good when black dog comes it will be all up to me and everything is up to me. I turn away and stab at the ground and I find a softer part where I can stick in the stick and make it stay and I practice. Over and over I roar like a daddy and I pretend the spot is black dog and he is scared and I get him dead. And I am the queen of the land and no one else can be. Sometimes it is a joy to hear her thoughts, like when she is playing with Stick or remembering something happy. But other times, it is heartwrenching to hear her trying to make sense of her situation. She can’t understand why her parents aren’t coming to get them. She tries so hard to be “good”, so they will come back. She doesn’t answer and neither does Daddy and no Stick so I cry and wait. They don’t come and it must be because they are so mad this time. I cry harder to show they better come soon and my tears are dropping in the water at my feet so it is getting deeper and I will drowned in the water if they don’t come and get me soon. The hardest part of the book, for me, was after they were rescued and brought home. Anna is brought back to a house that is hers, but it feels different. Grandpa lives there now, with his chair. Mommy and Daddy are in heaven, and ‘the black dog’ is still inside her. She hasn’t spoken since she came home, and the lady with the red mouth who comes to watch her draw seems to misinterpret her drawings, which, I think shows how hard it would be to get into the head of a child who is not speaking. It is too easy to make assumptions and think we know what is going on. I think dealing with the trauma after the event would be the hardest part to write about, especially if you haven’t experienced it in your own life. I found it realistic and heart-wrenching. I have heard that some people weren’t completely happy with Anna being the only narrator, but I liked it, and thought that it gave the book a different perspective on the events that happened. Another thing I loved about the book was the ending. It couldn’t have been better. For anyone who is reluctant to pick this book up, because you are afraid it might be horrifying, don’t be. There is a great article called Reading (and Writing) Through Fear that talks about exactly that. Does anyone have any good bear stories? Wow, this sounds like a unique story. I’m glad that you didn’t find it horrifying. It would be interesting to read about the aftermath and how a family/child copes. I can have a tough time with child narrators in certain books, but I’ve heard from several people that it’s done well in this case. I’m really looking forward to picking this one up at some point! I thought she did a good job with the narration. I think it would be a real challenge to imagine what a child might be thinking throughout an entire novel. I have never read Room, but now I would like to read it to compare. This sounds like a tough one to read. Just as a side note, for some reason, odd because I know very little about it, I’ve always wanted to see Nova Scotia. In my very biased opinion, Nova Scotia is beautiful, and you should come see it someday! I hope to do so. One difficulty will be getting there, because my husband declared a few years ago that he refused to fly anymore. I’m working on him, though, because sometimes it just isn’t convenient or possible to drive everywhere. Right now we’re in Texas, so quite a drive. In a few years we’ll be in Washington State, so farther north but much farther west. Lovely review. I agree with a lot of the things you said about it. I did have frustrations with Anna being the narrator at first, but when I looked back on the book I took it to mean that Cameron had done a great job with her voice. Who wouldn’t be frustrated listening to a 5 year-old tell a story for five hours? It did take a little getting used to, because of her rambling 5-year-old thoughts, but then I just got used to it, and I thought it added a unique perspective. Agreed. In hindsight it was really well done. Ah! That just reminds me that I still want to read Middlemarch, and am so tempted by Kirt’s Victorian reading challenge. I am letting myself get talked into far too many reading challenges at the moment. It’s actually starting to get a bit stressful. But I always have to encourage the reading of Middlemarch, at least at some point in your life. Yeah, it’s kind of easy to get carried away, isn’t it? I was one that didn’t find Room to be as good as everyone else and it was problems with the child voice. I don’t have much experience but it just wasn’t convincing to me. SO I am hesitant with this. And heartbreaking! yikes. But I am intrigued with the comment about how well the ending is accomplished. Some people have had a problem with the child narrator, but I didn’t, so I guess it is something you would just have to try out. I’m happy to have read it! Great review! I’m kind of on the fence since the narrator is a child and I’d get all emotional about kids losing their parents, but your endorsement is a strong positive! It is emotional at the end, after they’ve been rescued, but I think it was worth it. And the ending also made me feel better (but I won’t tell you why). I can see why some people don’t like child narrators, but I like hearing what goes on inside their heads (according to the writer, of course. But still, who else is going to do it for me?). I’m catching up on your reviews. I still really like this book and the author’s intentions, so while I found the child narrator irritating (perhaps because I have my own 5-year old narrator to deal with on a daily basis), I still appreciate the unique perspective her voice provided. I have camped quite a bit in Ontario and never really thought about bears (I will now with this book!). I actually saw my first bear (a mama bear with two cubs, i.e. a potentially dangerous situation) in Banff, Alberta. Luckily, we were on the gondola above ground and did not meet them face-to-face. From what I hear, bears are even more common out west. I always thought it would be fun to see one, but maybe not so much anymore. Thanks for the bear story! We have family in the Okanagan Valley of British Columbia and they are constantly under the threat of bears or wild cats wandering onto their property. We worry for them a lot. That would be scary with children!